Rob Zombie will guest on the History Channel series “Counting Cars” on Tuesday, July 16. At the Rockstar Energy Drink Mayhem Festival kick-off date for San Bernardino, California late last month, Zombie filmed behind-the-scenes for the History Channel series. The episode features the Count's Kustoms crew delivering a custom macabre-style overhaul on Rob's 1967 Ford F-100. 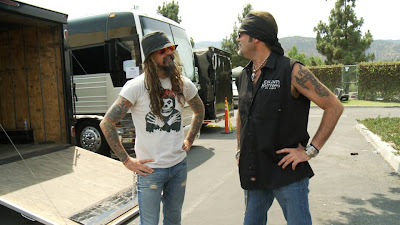 “Counting Cars" star Danny "The Count" Koker and his crew had just seven days to work on the truck and deliver it to Rob at the San Bernardino show — a turnaround faster than they've ever experienced on any project. Starting on July 19 in Camden, New Jersey, Zombie's 1967 Ford F-100 will be touring with the Rockstar Energy Drink Mayhem Festival. Catch Zombie on “Counting Cars” Tuesday, July 16 at 9 p.m. Eastern/8 p.m. Central Time.